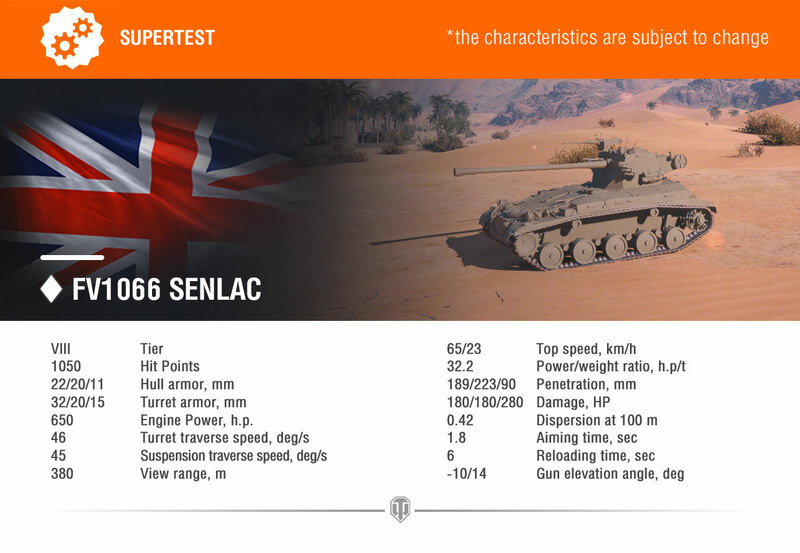 World of Tanks Supertest will soon receive a brand new British Tier VIII Premium light tank: FV1066 Senlac. This also confirms rumours of a brand new Light Tank branch for the British tech tree will be coming in 2019. What’s so special about this vehicle? The turret of this vehicle is at the rear, yet it’s a well-rounded light tank with a top forward speed of 65 km/h and a top reverse speed of 23 km/h. The Senlac’s gun has good armour penetration (189 mm with a basic round), small aiming time (1.8 seconds), and decent stabilization. Still, this tank cannot excel as a sniper because of low accuracy (the dispersion is 0.42 m at 100 meters’ distance). The Senlac’s HE shells deal 280 points of damage. They have 90 mm of armour penetration, making the Brit a real scourge of enemy vehicles with thin armour. The HE shells fired by the Senlac travel at the same speed as basic rounds (1020 meters per second) which means they are way faster than HE shells of other tanks. Gameplay-wise, the Senlac is much like the HWK 30. At the beginning of a battle, you can act as an effective active spotter. By the battle’s end, you can get more aggressive. The Senlac has a crew of three. Surprised? Excited for the new British light tanks coming? Let us know your thoughts in the comment section. More information and full details will be available soon. Definitely interested in this tank. On the other hand, this means that a British light line is in the works, and since a future British light line will probably largely consist of wheeled vehicles, this is sort of bad news for me since I hate the wheelchairs with a passion. The thing is that historically there have been very few British tanks featuring tracks that can be considered light tanks (which is why we have not seen a British light line so far), while there have been plenty of wheeled tanks, such as, for instance, the AEC or the Dingo. This went on why into post-war times with well-known tanks such as the Saladin. In short: Hardly any British light tanks on tracks, plenty on wheels. It’s going to be a normal LT line. No wheelies. I have been waiting for this, training a crew in the Covenanter. This honestly looks very underpowered. Its got worse gun stats than the other lights and has nothing really that special. They are hardly gamebreaking no matter how WG make it “overpowered”. Not when compared to your average premiums out there. Where did you see me say that lights are overpowered? Why bother? Does GB even have a tier X Light Tank? Is that actually confirmed or just a guess? I would’ve expected the SU-130PM to confirm a Soviet turreted TD line coming soon, but so far that hasn’t happened. I would still rather have the Chieftain VI…. Is this another made up tank? It is a School of Tank Technology design. Damn I was really hoping for a wheeled light line in the Brit TT but hey I’ll take whatever they give me in the British line. In which world this trash would be acceptable`? So a tank destroyer and a light tank are the same now? Ok?